The Tennessee Bureau of Investigation has sounded the alarm on the risks of fentanyl several times, but officials said drug users seem to ignore the warnings and public advisories. Assistant Director T.J. Jordan of the Drug Investigation Division said addicts are wanting stronger drugs for a better high despite the growing number of opioid-related deaths in Tennessee. The Tennessee Bureau of Investigation has sounded the alarm on the risks of fentanyl several times, but officials said drug users seem to ignore the warnings and public advisories. Assistant Director T.J. Jordan of the Drug Investigation Division said addicts are wanting stronger drugs for a better high despite the growing number of opioid-related deaths in Tennessee. He told NewsChannel 5 a story he heard at a recent conference regarding heroin laced with arsenic. for that high so bad they're willing to go to the drastic measure of having heroin with arsenic in it to put in their bodies," Jordan said. However, the problem seems to have no end in sight now that people are using drugs in group settings with a designated person. Narcan, the brand name for Naloxone, is available to help revive a person who is overdosing. Depending on the strength of the drug or counterfeit substance laced with a typically unknown amount of fentanyl, it may take multiple doses of Narcan to prevent deaths. "We're starting to see where drug addicts are using together with their colleagues in an attempt that if they crash, there is somebody there to revive them," Jordan added. Fentanyl is linked to about 500 of the nearly 1,300 opioid-related deaths in Tennessee in 2017. The number drastically jumped by 70 percent since 2016, surpassing the amount of heroin-related deaths. The highly potent and potentially deadly opioid is being mixed in with other drugs including heroin. It is an ongoing trend intensified by Mexican drug cartels now that the Chinese government has put restrictions on fentanyl-based products, according to Jordan. So far this year, submissions to the TBI lab had 841 test positive for fentanyl and other analogs, including carfentanil. The amount was eight times more compared to 2015. "We're having mass casualty events in this country every day as it relates to the opioid crisis and overdoses," Jordan described. 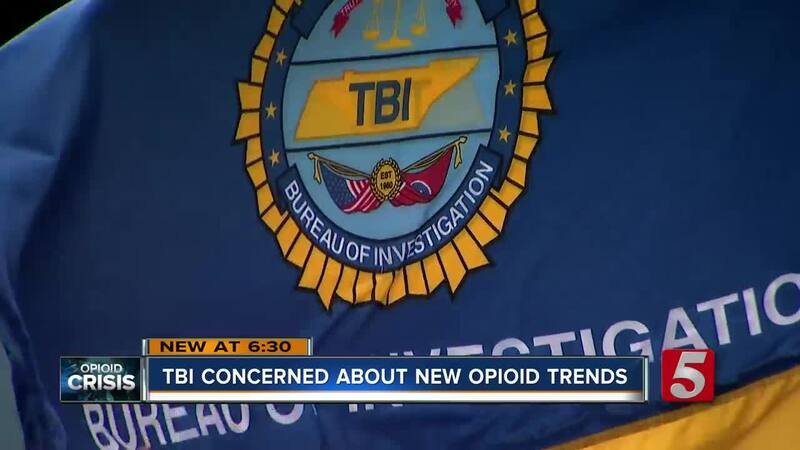 The TBI is in the process of hiring ten additional drug agents, but Jordan stressed that making arrests will not solve the problem. "At the end fo the day, if you are a drug user, you need to stop and get help. If you are the friend or family of a drug user, you need to stop what you are doing right now and get them help," Jordan urged. If you or someone you know is in need of help, contact the Tennessee REDLINE at 1-800-889-9789.